What is now known, however, is that while the death toll in Libya when Nato intervened was perhaps around 1,000-2,000 (judging by UN estimates), eight months later it is probably more than ten times that figure. Estimates of the numbers of dead over the last eight months – as Nato leaders vetoed ceasefires and negotiations – range from 10,000 up to 50,000. 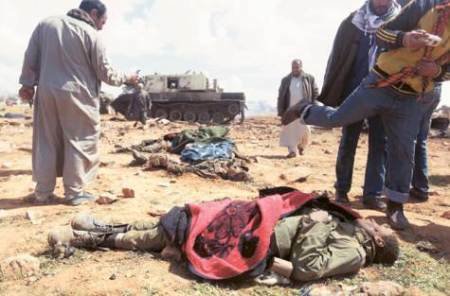 The National Transitional Council puts the losses at 30,000 dead and 50,000 wounded. Of those, uncounted thousands will be civilians, including those killed by Nato bombing and Nato-backed forces on the ground. These figures dwarf the death tolls in this year’s other most bloody Arab uprisings, in Syria and Yemen. Nato has not protected civilians in Libya – it has multiplied the number of their deaths, while losing not a single soldier of its own. The larger figure of 30,000 deaths quoted by Milne is the one given by the National Transitional Council (NTC) for those killed on both sides during the whole of the conflict, and includes 8,000 said to have been killed by the Gaddafi regime before Nato’s intervention had even started. To point out that the killing continued after that point is hardly proof that Nato caused more suffering than it prevented. The opposite conclusion – that western intervention saved lives – still seems far more convincing. A second reason for refusing to accept moral equivalence between victor and vanquished is that the atrocities said to have been committed by rebel forces in Sirte appear to be the result of indiscipline and weak central command rather than a planned and co-ordinated programme of state terror. Had it been the latter there would doubtless be evidence of a pattern of similar behaviour in other areas liberated by the rebel authorities. Instead, the NTC instructed its forces to refrain from looting and revenge attacks, and the weeks taken to capture Sirte show at least some concern to minimise civilian casualties. This entry was posted in Human Rights, Politics and tagged Libya, Muammar al-Gaddafi, NATO, NTC, Qaddafi, Seumas Milne by scottlong1980. Bookmark the permalink.